The Mincing Mockingbird returns! Actually, this book came out before the other two, but this is the first time I’ve seen it. 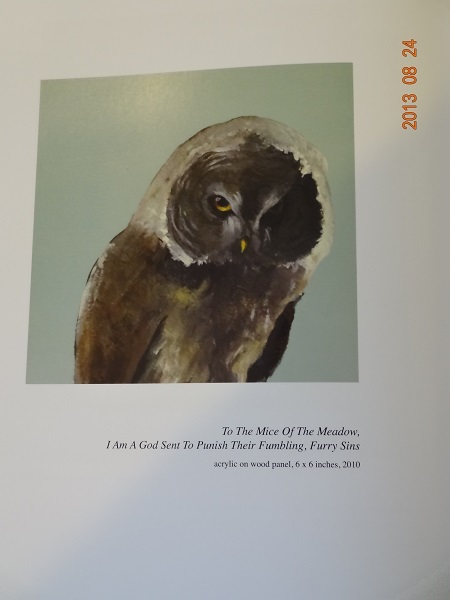 This time, Matt Adrian write a book for “anyone to quickly identify psychotic, violent or mentally unstable bird species.” As usual, Adrian’s paintings of birds are accompanied by crazy things the birds seem to be saying from the way they look. There are some entries for birds that go on for a page or more. The Mincing Mockingbird paintings at Whimsies–but no owls! There are two entires that I spotted for owls, which made me happy. Of course what’s written about owls is not complementary, but a study in the owl psyche. Like other birds, owls cannot be trusted. New paintings come to Whimsies, which carries the book as well as the paintings. I was told by Karen that Adrian never does the same paintings; he doesn’t have a set number of this or that bird on hand, he just paints. Apparently, he hasn’t painted any owls lately. The last shipment had two or three different owls in it, so I should have bought then. 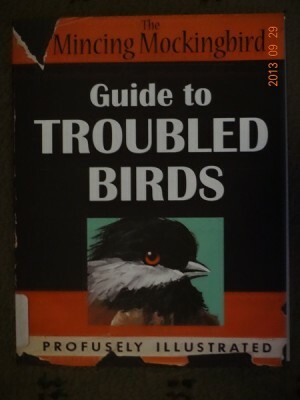 So if you like twisted humor and birds, this book is for you. Under the name of the Mincing Mockingbird, Matt Adrian sells his paintings of birds. In two books, Adrian has images of his paintings accompanied by odd, bizarre and downright funny captions which, from what I can tell of his web sites, are apparently the titles of the paintings. The Frantic Meerkat, which can be found on the Mockingbird web site, is not only birds but different animals, including humans, with silly captions. My favorite bird has always been the owl, and they are well-represented in the books: the snowy owl who gets tired of leering; the owl believing that he/she is the meadow god sent to punish the sins of mice; another snowy owl that rejects fellowship and admits to being a “dark sun” of rage. There are many different birds, but I could only recognize a few of them. The hummingbird on a sugar high made me laugh as did the profile of the dodo; if cloned, this bird’s first act would be to kill us all. Fair, since humans hunted the species into extinction. Then there’s the bird that didn’t finish high school but kept sea monkeys alive for two weeks (how many of us can say that?) and another who heard the moon laugh (and once was enough). Whimsies Incognito in Tarrytown sells not only Adrian’s books but also his bird paintings. The large selection of bird paintings have contracted over the past several months until only four remain. There were a few really nice paintings of owls. Unfortunately, I did not buy them when they first came and now they are gone. I will have to wait for the next shipment; more bird paintings should be back in stock before the end-of-year holidays. Adrian’s paintings are very nice, but combined with the titles/captions/whatever in the books, the result is just laugh-out-loud funny.